Hanoi (VNA) –The US Department of Commerce (DOC) has announced its decision to adjust antidumping duty on Vietnamese shrimp exported to the US between February 1, 2013 and January 31, 2014 from 1.16 percent to 1.42 percent. The decision was made following changes in dumping calculations, although on September 7, 2015, the DOC publicised results of its ninth administrative review (POR9) on frozen shrimp imported from Vietnam. The DOC has used a country with a similarly sized economy to set the level of anti-dumping duty on Vietnamese shrimp. In previous years, the department used rates from Bangladesh. However, this year, a group of US vessel owners and processors complained, prompting the department to replace Bangladesh with India. Companies that import products from Vietnam into the US have to pay cash deposits and the dumping margins will be taken from these deposits. The higher anti-dumping duty will increase the price of Vietnamese shrimp in the US, hurting the product’s competitiveness. Tran Van Linh, General Director of Thuan Phuoc Seafood and Trading Corporation, said Thuan Phuoc was one of three companies facing high anti-dumping tax rate during the POR9. With the re-evaluation, the duty imposed on concerned units may increase and differ, he added, explaining that export countries set anti-dumping tax aiming to protect domestic production. 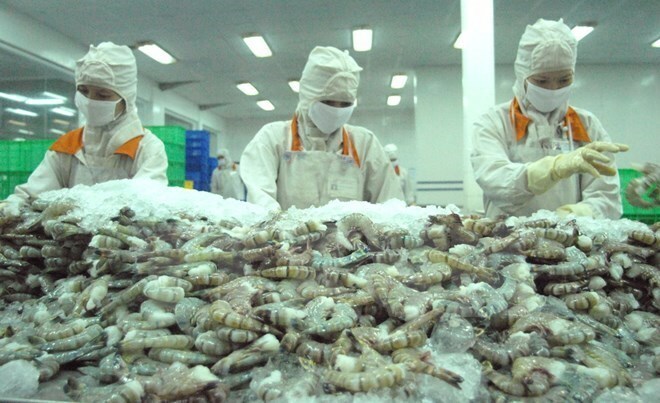 Linh noted that it is even harder for foreign seafood to access the US market as new President Donald Trump’s administration has focused on defending domestic production. According to Truong Dinh Hoe, General Secretary of the Vietnam Association of Seafood Exporters and Producers, US vessel owners and processors complained to the Court of Appeals for the Federal Circuit that Bangladesh’s wage level is too low to be used for duty rates. Although the court issued the award, Vietnamese companies can bring the case to a higher court, Hoe said, noting that the new duty tax will not be applied until the final judgement is made. Since the beginning of 2017, the DOC extended antidumping duties on frozen shrimp imports from Vietnam for another five years.